I haven`t done any food related posts yet, which is surprising since food is such a big deal here. Every area in Japan has its own food speciality that is part of its tourism and many people will visit a place just to eat its local dish. Just like in Italy, a lot of value is put on regional differences, and some dishes can only be had in the places where they were created. I had read up about the foods typical to Shikoku because I knew that after my trip I would be asked by my co-workers if I ate them. For our first few days in Shikoku we survived mainly off rice balls bought in convenience stores as we were doing our pilgrimage and visiting different attractions. 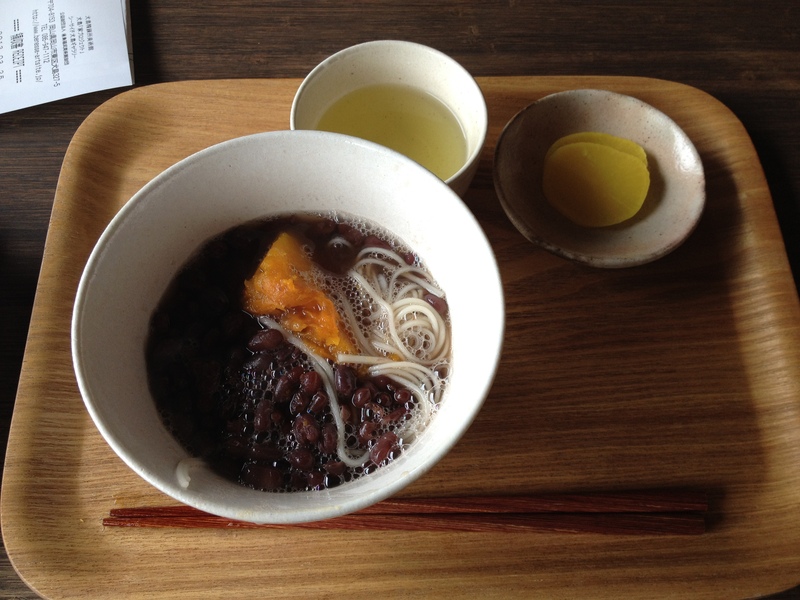 The first fancy dish we had was at the cafe on Inujima where we had soba noodles with kabotcha (pumpkin) and anko (a sweet paste made from red azuki beans that`s very common in traditional Japanese confectionery), served with pickled daikon (a kind of turnip) and green tea. 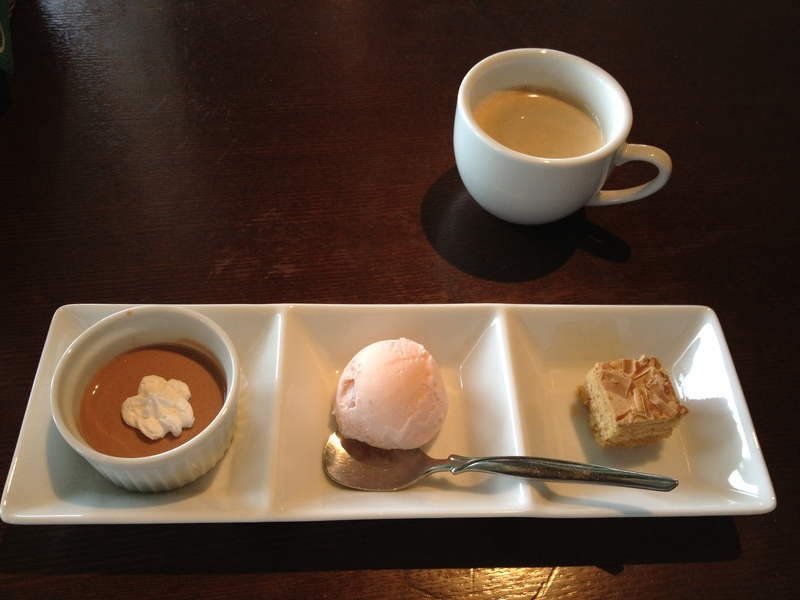 It was nice but very sweet and not particularly filling. Unfortunately, this was not a day that we were going to be sated. When we were on Teshima, we were more concerned with getting to our remote guesthouse before it got dark than finding somewhere to eat. So that meant when we got there and saw that there was nothing, all we had to eat were the remains of our store-bought supplies. We soldiered on until lunchtime the next day, luckily the amazing views of Teshima kept us enthralled, until we got to Uno Port and stuffed ourselves with pizza followed by a dainty dessert. From then on however, we had a host of new foods to try everywhere we went. 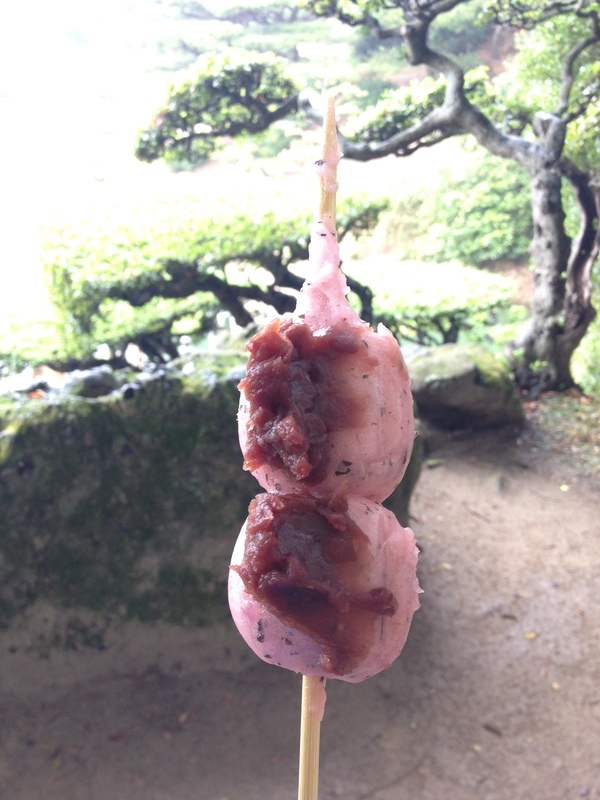 In Ritsurin park in Takamatsu I had a mid-morning snack of cherry dango (a kind of dough made from rice) that were heated around a grill and served with a slather of anko. I had eaten the top one before I remembered to take a picture. 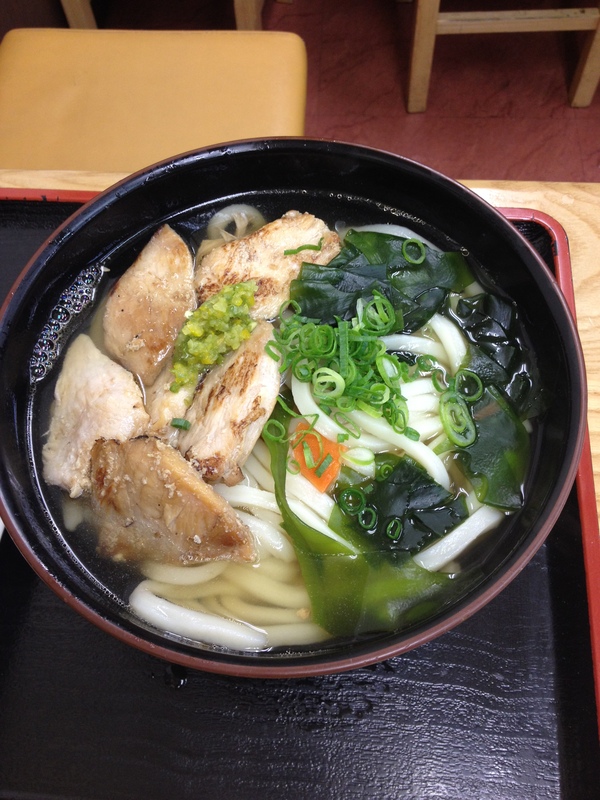 Takamatsu is famous for its udon noodles which are supposed to be firmer than the ones you get elsewhere in Japan. I just got a regular serving of udon but the picture below is of Jenny’s which was flavoured with yuzu, a Japanese citrus fruit, that was absolutely delicious. We had our greatest culinary experiences in Kochi, and we were welcomed to our guesthouse with a sake-testing event. Kochi is the capital of sake-drinking in Japan and the owner of the guesthouse used to work at a sake brewery in Hyogo prefecture. 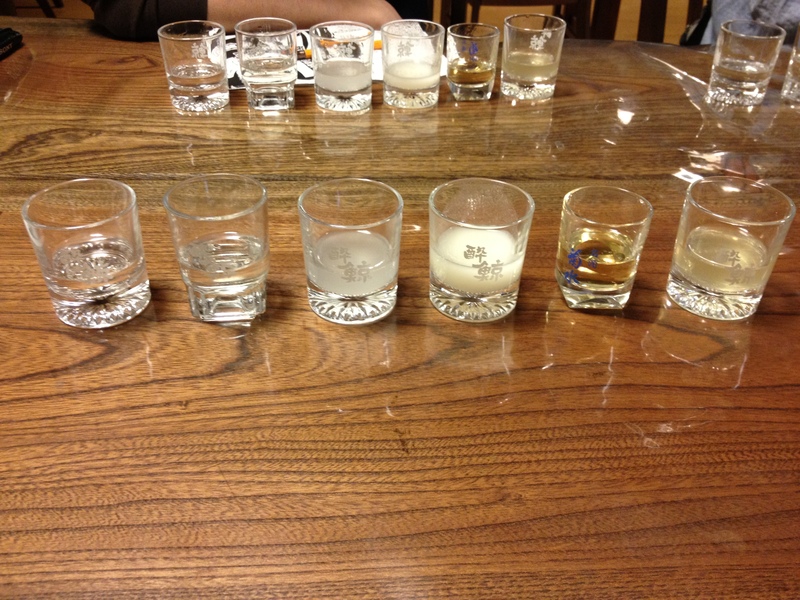 I’m not a big sake drinker, but I enjoyed trying the different types and it was great to learn a bit about it as well. The process of making sake is different to other types of alcohol, and different types of sake are made depending on how much of the hull of the rice grain is polished, and if the rice/water/mould mixture is filtered, pasteurized or if more alcohol is added to it. The next day at the food market in Kochi was a literal feast. 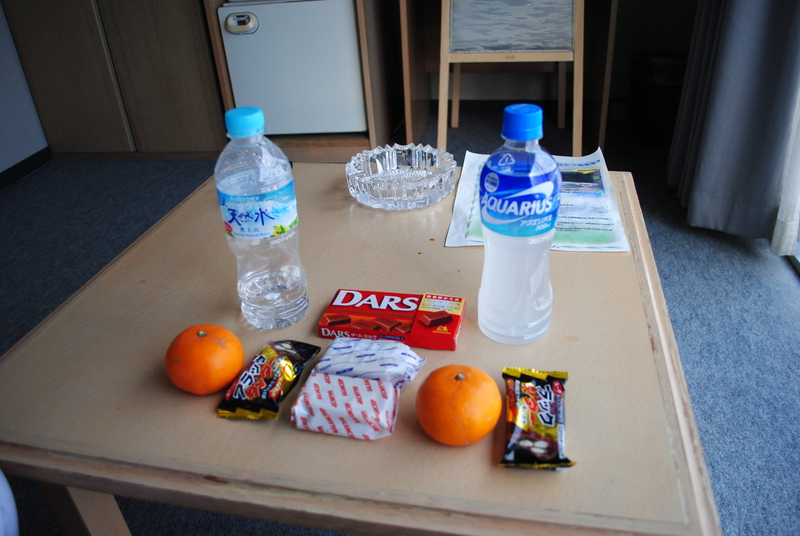 There were so many kinds of foods there that we didn’t know where to start. 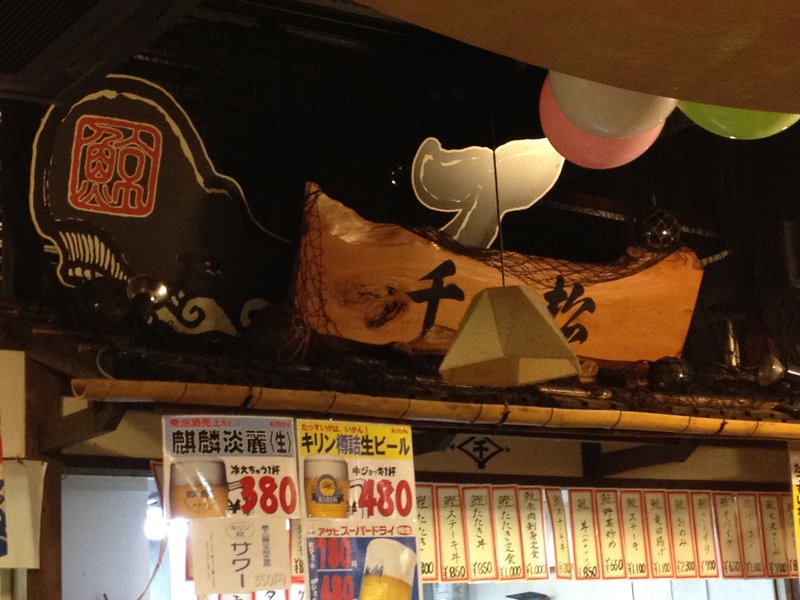 The photo above shows a shop selling whale, which I abstained from. 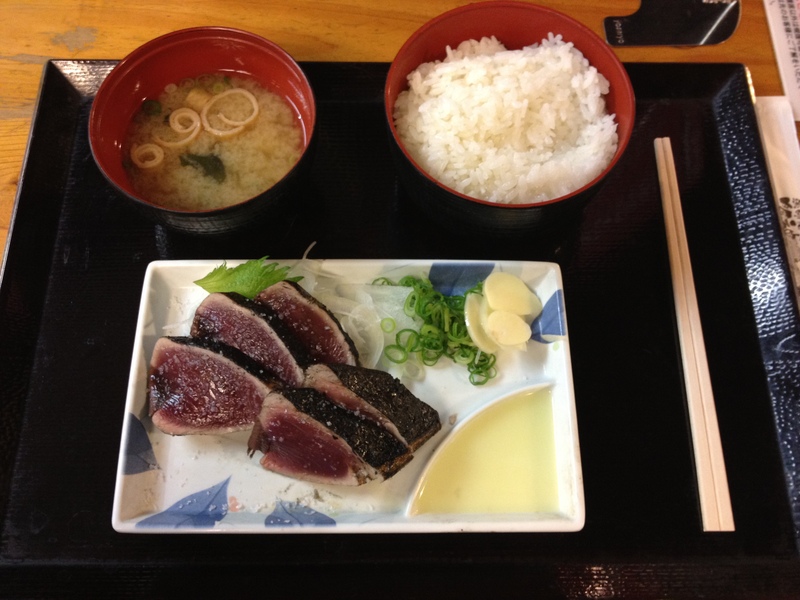 Kochi’s most famous dish is katsuo no tataki, bonito fish that is quickly seared over a straw fire right in front of you. It’s sprinkled with salt granules and served on a plate with onions, spring onions, garlic and a yuzu dipping sauce. I got the set which came with rice and miso soup. It was so good. 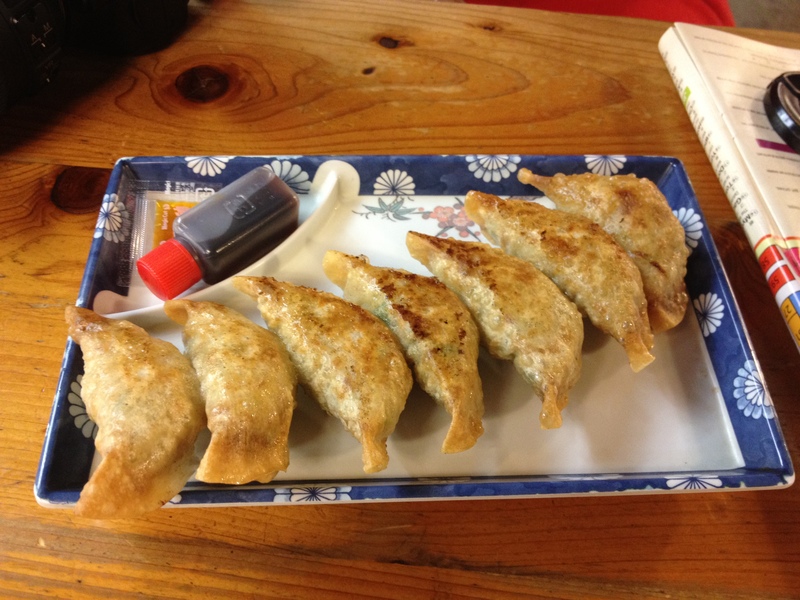 We also had some deep-fried gyoza which are dumplings filled with a pork and herb mixture. Most commonly they are just pan-fried so that they’re only crispy on one or both sides, but these ones were crispy all over. Gyoza are great comfort food and I think of them as the Japanese (or Chinese) version of sausages. 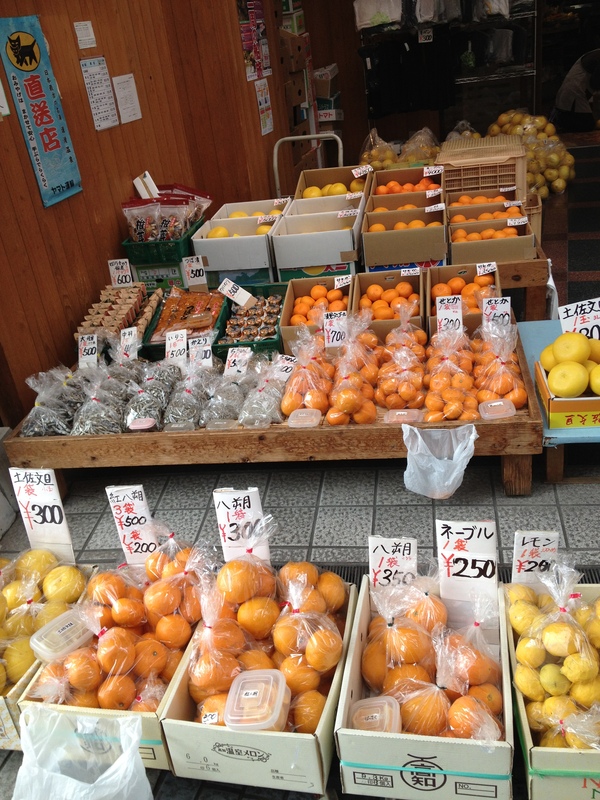 On to Ehime prefecture which has a hard time keeping up with its culinary neighbour as the food it’s known for is the mandarin orange. 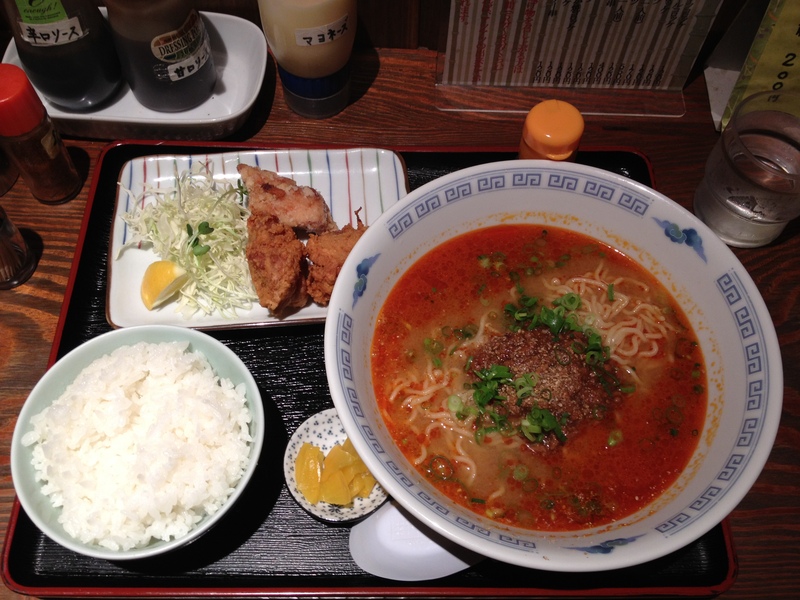 I did have a nice meal in a ramen shop in Matsuyama where I had tantanmen, noodles in spicy broth with minced pork on top. 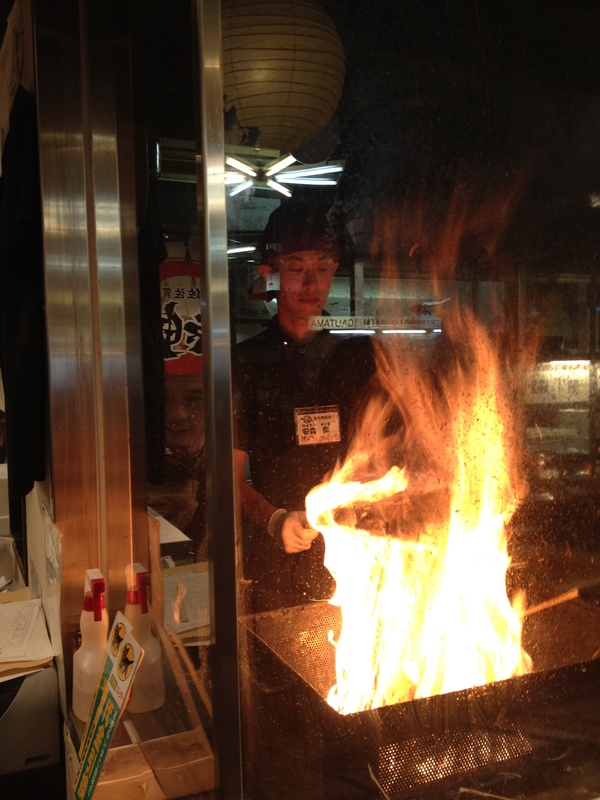 Quite a lot of Japan’s cuisine is from China, although they don’t like to admit it. And finally, although this wasn’t technically in Shikoku, at our guesthouse in Onomichi, we had the Japanese classic dish of curry rice. 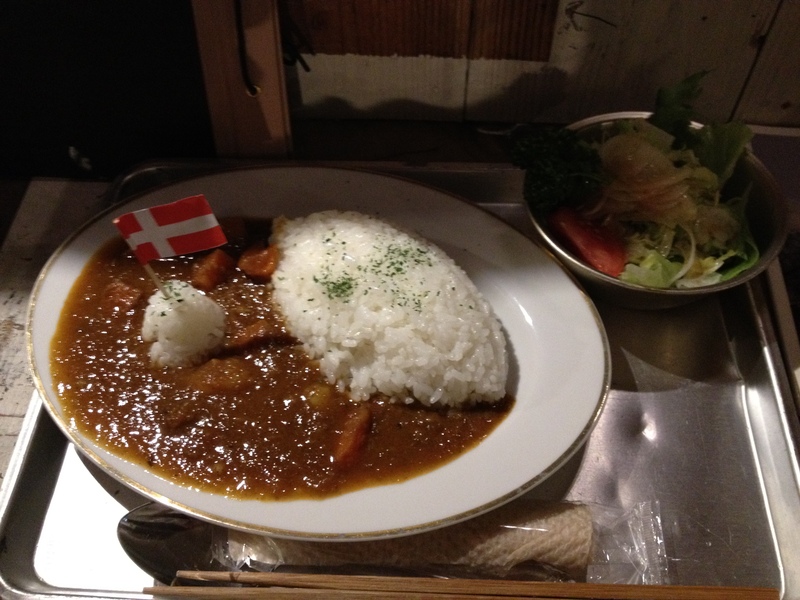 Japanese curries aren’t like any others you’ll find because they were actually influenced by English cuisine! Back in the Meiji era when India was still part of the British Empire, the Navy would add curry powder to their stews, so Japan took this on as curry, which is why it’s more like a stew than a curry. This is just the food I ate on my trip, some of which were regional specialties, others are ubiquitous Japanese fare, but Japanese food is a lot more varied than people might think. Sure, the flavours can be milder than in other cultures, but they do like to experiment.